Citation Information: JCI Insight. 2019;4(1):e123611. https://doi.org/10.1172/jci.insight.123611. BACKGROUND. Pulmonary arterial hypertension (PAH) is a deadly disease of the small pulmonary vasculature with an increased prevalence of insulin resistance (IR). Insulin regulates both glucose and lipid homeostasis. We sought to quantify glucose- and lipid-related IR in human PAH, testing the hypothesis that lipoprotein indices are more sensitive indices of IR in PAH. METHODS. Oral glucose tolerance testing in PAH patients and triglyceride-matched (TG-matched) controls and proteomic, metabolomics, and lipoprotein analyses were performed in PAH and controls. Results were validated in an external cohort and in explanted human PAH lungs. RESULTS. 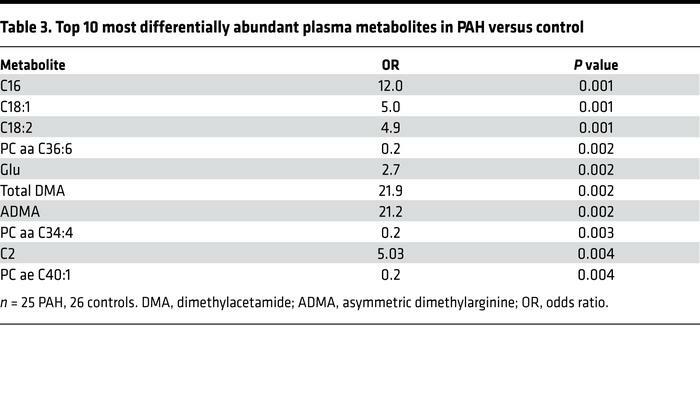 PAH patients were similarly glucose intolerant or IR by glucose homeostasis metrics compared with control patients when matched for the metabolic syndrome. Using the insulin-sensitive lipoprotein index, TG/HDL ratio, PAH patients were more commonly IR than controls. Proteomic and metabolomic analysis demonstrated separation between PAH and controls, driven by differences in lipid species. We observed a significant increase in long-chain acylcarnitines, phosphatidylcholines, insulin metabolism–related proteins, and in oxidized LDL receptor 1 (OLR1) in PAH plasma in both a discovery and validation cohort. PAH patients had higher lipoprotein axis–related IR and lipoprotein-based inflammation scores compared with controls. PAH patient lung tissue showed enhanced OLR1 immunostaining within plexiform lesions and oxidized LDL accumulation within macrophages. CONCLUSIONS. IR in PAH is characterized by alterations in lipid and lipoprotein homeostasis axes, manifest by elevated TG/HDL ratio, and elevated circulating medium- and long-chain acylcarnitines and lipoproteins. Oxidized LDL and its receptor OLR1 may play a role in a proinflammatory phenotype in PAH. FUNDING. NIH DK096994, HL060906, UL1 RR024975-01, UL1 TR000445-06, DK020593, P01 HL108800-01A1, and UL1 TR002243; American Heart Association 13FTF16070002.